Home » creative » Facebook » Food n Beverage » Free » MARIGOLD » video » Zalora » Aug20-30Sept: #MarigoldYogurtDrinkDance Contest: Win shopping spree at Zalora worth RM1,000! 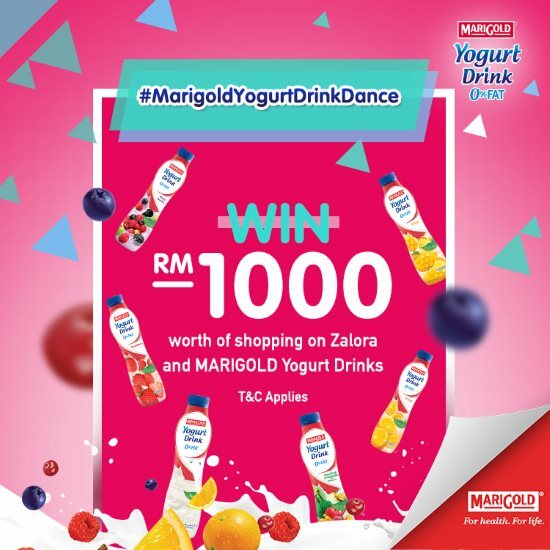 Aug20-30Sept: #MarigoldYogurtDrinkDance Contest: Win shopping spree at Zalora worth RM1,000! Just upload your #MarigoldYogurtDrinkDance video on Facebook with the hashtag - make sure it’s viewable by the public. Share your video link in the comment section of this post and hashtag #MarigoldYogurtDrinkDance before 30th Sept 2016. Visit #MarigoldYogurtDrinkDance Contest page for more details.